It started as a hobby, if not a necessity; Benjamin Weber had just moved to Japan and he needed to eat on the cheap. Jobless in Tokyo after moving on a whim, he had a little money and a lot of free time, so he started searching for the best ramen, a meal that’s always affordable. After doing this awhile (and getting a job), Ben, a self-proclaimed completionist, decided to challenge himself further; he decided to eat at every ramen shop featured in the Ikebukuro section of a magazine called Ramen Walker. And he did. By the time he moved to Osaka, eating on a budget was less of a concern, but the compulsion to try local ramen remained. He scoured so many shops and slurped so many noodles, photographing each bowl before devouring it, that he began to feel like his efforts should be put toward something more productive. Back in Tokyo, there had been countless English-language blogs about ramen, but in Osaka, no one was writing about the subject in English. It wasn’t long after this revelation that a blog was born. As a completionist, Ben is obsessed with stamp rallies (he calls them “dangerous”), and even created one of his own. The Osaka Ramen Route is for English-speaking tourists and expats to have more access to ramen in the city. English-language information about local ramen is still scarce, so it’s likely many worthy shops are getting overlooked. The rally features five shops located in and around popular areas like Umeda and Horie. The prize for visiting all five is a certificate and, of course, a guided tour of some of the best ramen in town. Mechakucha has a quirky, hipster vibe not normally felt in the average ramen-ya. The atmosphere has nothing on the soups, though – Mechakucha specializes in unique fusion-ramen flavors like Thai Tom Yum and the Taiwanese-inspired bowl made with flavors like star anise and clove. Not only is this ramen unlike any other, it’s damn good too. There might be a bit of a wait to get into this ramen shop in Horie, but it’s worth it. The soup awaiting you inside features a creamy broth made of fish and chicken, two flavors which compliment each other surprisingly well. The atmosphere is friendly and lively, and the staff wear matching T-shirts styled like the iconic MTV logo, except the letters are MTK to represent the shop. They also have a tasty tsukemen (dipping ramen). This is a somewhat unusual shop located in Nippombashi (where else? ), otherwise known as the hub of all things geek. The ramen is soupless and features a range of customizable toppings, including dried sardines. This spunky shop is represented by a noodle tornado as its mascot and is very proud of its support of working women – all its staff and managers are female! This cozy shop is located just down the road from the Umeda Sky Building, making it a good stop while sightseeing. This also happens to be Ben’s favorite ramen in Osaka! He recommends keeping it simple and trying the standard miso (white or red) on your first visit, but says there are often interesting seasonal variations on the menu, like squid ink. They also serve the award-winning local Minoh craft beer. Another shop featuring a bowl combining two flavors is Kikuhan, where pork and chicken mix to create a tasty, frothy broth that is sure to satisfy. Add creamy eggs, large chunks of chashu, and gingery pork balls, and you’ve got yourself quite the meal. 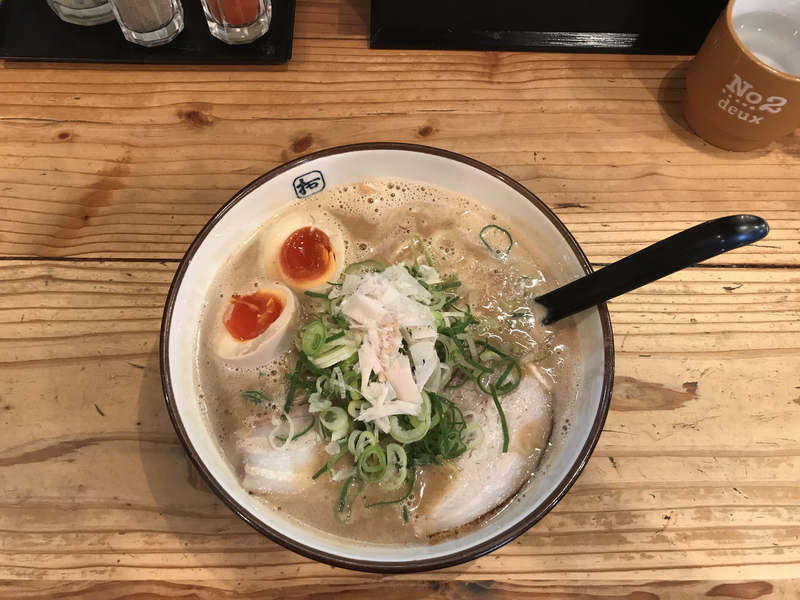 Kikuhan is located in Nakazakicho, a cute neighborhood known for a plethora of independent coffee shops and art galleries, that should be recognized for ramen, too! For more information, check out osakaramenroute.com. The stamp rally is on until the end of July. Friendsinramen.com is available to peruse year round if you can’t get enough. Happy slurping!